Official WebSite of Teddy Young and the Aces!! The popular past time of social networking (namely Facebook™, Twitter ™ and MySpace™) that has come to be over the past decade has helped us all define our individual personas via the computer. We are now a society that is consumed by status. We spend hours of our lives reading about others’ and updating our own as we walk through life. Regardless of what makes us who we are, or what we’re doing with our lives, we can relate it to a status. What we want or expect and what we need or hope to be is defined by an update or vast statement that helps to clarify our direction, intention or mood. That being said, it is clear how some are perfectly content when they reach their comfort zone, at work and at home. But, then there are those who are never quite satisfied with being ranked with the status quo. Teddy Young and the Aces are a fine example of talent that meshes with the latter statement. But rather than reaching for their mouse and keyboard, it is best to see them on a stage, plugging in and strapping on their instruments. Watch them intently and they will pull you into their world of finely tuned, cut –throat blues. This thrilling trio has been playing the regional club circuit for nearly two decades. 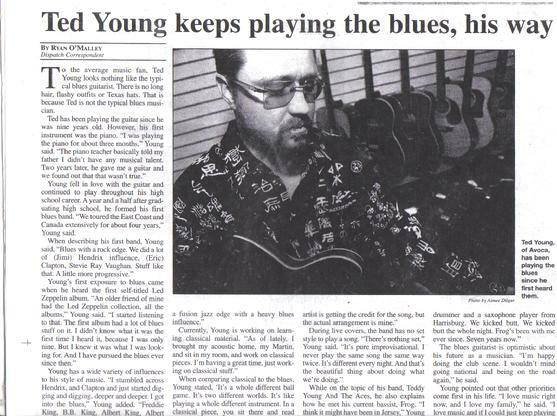 Led by music veteran and dynamic blues guitarist, Teddy Young, we find one of the best examples of such an individual never quelled by the status quo stature. Young continually strives to reach outside his comfort zone in an effort to break the boundaries of his own talents and he has done so continually throughout his career. With nearly three decades of playing under his belt he, as a musician, is always looking forward in his quest to capitalize on the ambitions of his creative musical genius. Make no mistake either, although I say capitalize; it has never been about the money or fame for this player. It has more to do with satisfying the passions of his being. Nowadays, he is turning inward as he takes his groove in a more customized and personal direction. After so many years of allowing his influences to pave his way, Young is now taking all of that history and using it to find his own voice and expression of it with original overtones. This has been a long time coming, but like with all things in life, it comes at the time it is meant to happen for this fundamentally skilled band leader. “After so many years of playing, you get to a point where you find your own style and incorporate it into your playing. After almost thirty years of playing, I have definitely reached that stage of my career. Influences will always be there, but then there comes a time when you have to take what they gave you and bring it into your own creations,” Young said. In these years of shaping his own style, he has remained true to the roots of music by sticking with the realm of the blues. His dedication and skill has made for a solid forum for this music genre. His talent to deliver it with such exuberance gives him the right to be listed among the ranks of the many greats that have brought life and focus to the blues. He has been a determined player in keeping the blues alive throughout his career. Starting out truly as a young gun he found an interest in the guitar by the age of nine, but only after not finding joy in the piano at age seven. This new hobby offered Young an escape from the drone duties of boring school work. As a student, he excelled to the top of his class, with ease. As a musician, he excelled to the top with his craft, with much the same ease. He has never been one to do anything half cocked. In fact, he has been balls to the wall since the start. His career took a professional turn while he was still in high school. Now, more that 20 years after the fact, Young continues to play as though the music pours directly from his soul and resonates through his hands. His energy on stage is incredible and his fiery spirit is heard in every note he offers. It wasn’t long after Young mastered the progression of his own influences that he moved out of the basement and onto a stage. By age 15 he was jamming with cats that were nearly twice and even three times his age. By 16, he was offered his first steady gig with the four piece outfit, Blue Heat. After several months of gigging with them, he was invited to join the five piece unit, The Merchants of Groove. After a couple of years of kicking around riffs and chords there he moved on from both of those bands and fused together his first assembled ensemble, a trio known as Stone Free. At the age of 21 he switched gears and company again and formed Young Gun and the Santa Fe Blues Band. It was during that era that Young hit the ground running. The band toured up and down the Atlantic coast and made their way through Canada on a few occasions as well. This outfit stayed busy 25 days a month and often more when you consider the traveling they endured between shows. Toward the end of 1994 however, the Young Gun grew tired of being dragged from gig to gig and decided to take a greater interest in his own career and its direction. 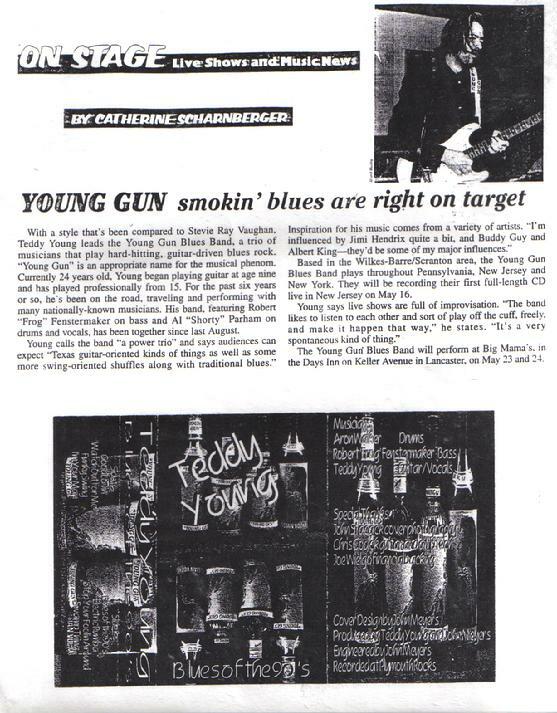 Upon firing his bass player/booking agent the Young Gun Blues Band soon emerged. By the turn of the millennium, that trio became better known as today’s reckoning blues force; Teddy Young and the Aces. Over the years, Young has done what all musicians hope to do in their careers. He has logged hours in the studio, recording and creating his own sound, as well as offering his talents to others session work. He has logged miles, traveling to and fro so to deliver his music to audiences near and far. He has stepped outside of his comfort zone of that as a musician so to represent himself and manage his career. He has been on the radio and he has appeared on TV as well. He has played on stages big and small, with those who are well known by the masses and too, with many who are unknown by the populous. In fact, when it comes to conquering the music business, the only stone left unturned is that of a major recording deal. The band is currently working on a collaboration of originals with the hopes of finally turning over that last stone. Though some might feel it is a long overdue venture, Young believes that it is truly unfolding when it should. Such a break needs many things to be in line so to make it a success. At least, with taking his time to grow and mature with his music, he will be able to avoid many of the pitfalls that take many players out of the game. Perhaps the one thing that keeps this player up to snuff on his abilities is the fact that he lives and breathes music. It is his foremost thought in life and it has been his only direction since he was a young child. In an effort to make ends meet, this family man keeps busy playing gigs at night, private parties with the band often on weekends, doing session work in the studio with other outfits during his days off and teaching guitar to students of all ages throughout the week. Given his tight schedule, there is never any time for rehearsal for the band; they simply run on their experience and ability to gel with each other. This allows them to deliver a new show each night and give the audience a nice mix of off-the-cuff blues standards, well-known classics and edgy originals. Speaking of the band, this current formation of players has many years of experience. Each of them have toured and gone through their own schools of hard knocks. Bass player, Robert Frog Fenstermaker has been a key player of Young’s rhythm section for the past 17 years. Before laying his groove here, Frog did plenty of session work for many different genres of singer/songwriters. He also spent years with upbeat and jovial band Blue Sparks from Hell. Rounding out the rest of the rhythm section on his own custom built snare is the talent of drummer, Neil Longo. Longo fine tuned his craft as a drummer by studying with Joe Cusatis at the Modern Drum Shop in NYC. From there he logged many years with Jay and the Americans before meeting up with Young nearly five years ago. When not working with Teddy Young and the Aces, Longo keeps it real with crafting the perfect snare. Longo Drums have known great success and have earned a name in the industry with a recognition that combines quality and fine craftsmanship. To check out his product line you can log on to www.longodrums.com. Whether you are in the mood to have your soul soothed melodically by the sweet sounds of Young’s guitar or if you are ready to tear it up on the dance floor to the on-time and upbeat sound of the band, the will definitely deliver what you want!